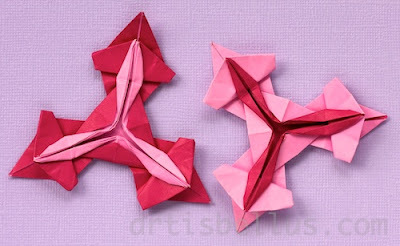 Origami encourages creativity. 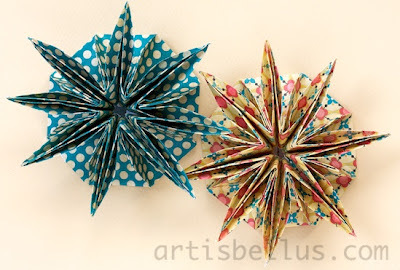 Even if you do not create your own models, you can exercise your creativity by selecting different papers and colors, combining different models in a display, or finding practical uses for the models. The modular in the picture above is called "Ore", and was designed by Toshikazu Kawasaki. 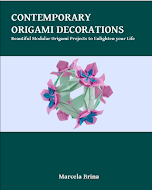 The diagrams are available in his book, Greatest Dream Origami (ISBN 9784255005058). It consists of six units, that are very simple to fold and assemble. The flower and the leaves are a variation of the traditional lily. I used 8" (200 mm) squares of coordinating scrapbook paper to fold the models. 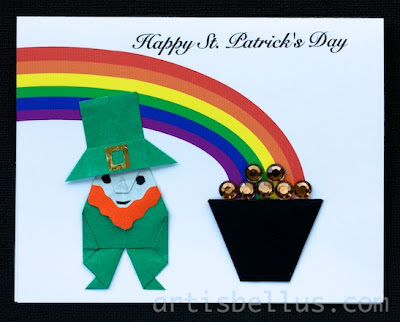 In the Irish folklore, there are many stories about leprechauns and their magic powers. Leprechauns are said to be mischievous fairies. They are shoe makers and hide their pots of gold at the end of the rainbow. If ever captured by a human, they will grant three wishes in order to be released. 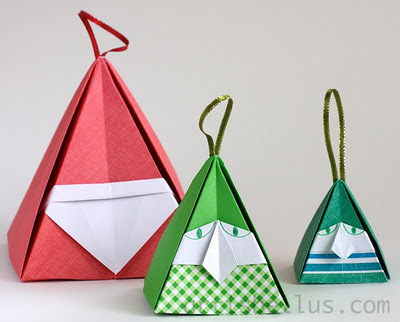 Dwarf, designed by Kunihiko Kasahara, from the book The Magic of Origami . The model has two parts: body and cap. I only folded the body, using a 3" (75 mm) square of regular origami paper. 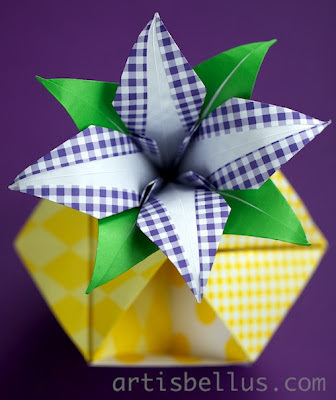 Hat (variation), designed by Gay Merrill Gross, from the book Minigami , folded with a 1¾" x 2½" (44mm x 63 mm) rectangle of regular origami paper. Cup, traditional model, folded with a 3" (75 mm) square of regular origami paper. I printed the rainbow and the greeting on a letter size sheet of card stock, that I cut in half. The rest are paper cuttings and rhinestones.